For voice/data/video distribution, our cable will handle bandwidth-intensive applications up to 500 MHz. Meets all Cat6 TIA/EIA-568-B-2.1. SF Cable CAT6 patch cables are made of 100% bare copper wire and 50 micron gold plated RJ45 plugs. Why 50 micron? We do not use CCA (aluminum wire). What is CCA? Our Cat6 550Mhz Snagless Patch Cables will handle bandwidth intensive applications up to 550 Mhz and beyond. 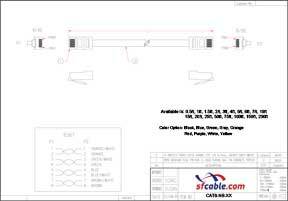 Meets all Cat6 TIA/EIA-568-B-2.1.